If you are looking to all those juicy personal life details...don't look here. If you want to know about a great actor well then...read on. A figure walks toward you, his eyes a cold icy blue...smile bearing a set of canine teeth. The same figure reappears a shock of blonde...dirty three day scruff...electric yellow sunglasses...killer smile. Even a bit later...long dark locks...chocolate brown eyes...typical grunge black t-shirt and blue jeans. You've just taken a walk backwards into the career of Stephen Dorff. Haven't heard of him? There's a very good reason why. Believe it or not, it's all choice. Stephen isn't your typical actor. He isn't bitten by the hunger for fame, but instead by the force of respect and the feeling that he's doing something worthwhile. Not to say that he doesn't enjoy being famous. "I'm young and crazy and a hormonal psychopath for beautiful women. So why not, in my position, date gorgeous girls?" He doesn't put on a facade. He smokes his two packs of Camel lights a day, drinks coffee, eats junk food. He uses the "oh so taboo F word", mentions that he doesn't like everything in his movies, composes music for roles he's playing, enjoys photography. He's been in thirty or so music videos...collects vintage guitars...is friends with a ton of influential people in Hollywood. Stephen began acting when he was thirteen. His parents didn't want him to. Probably gave a bit more incentive to do so. His father, Steven, composed music for all the big sitcoms...Growing Pains for example. He kicked off his career in the TV movie "In Love and War", followed it up with a performance in the horror film "The Gate". He then began a string of appearances on TV sitcoms: Blossom, Married with Children and Rosanne to name a few. He interdispersed those appearances with TV movies: "The Absent Minded Professor" ('88), "Wonderworks: Hiroshima Maiden" ('88), "Quiet Victory: The Charlie Wedemeyer Story" ('88), "I Know My First Name Is Steven" ('89), "Do You Know The Muffin Man?" ('89), "I Will Always Remember You" ('90), and "A Son's Promise" ('90). His breakthrough performance came at 17 in "The Power Of One" where he played the role of PK, a boxer in South Africa against apartheid. Dorff won this role over a bunch of actors, and was praised by critics for the performance. His next movie "Judgement Night" seemed like a good idea at the time, it was easy, it was thought to be a big part...something to drum up the publicity. But the movie failed to pick up much speed. In fact, Stephen himself didn't much care for it. "I did Judgement Night, but I'm not really proud of it...I was advised by my agent to do a major film because it would help my career...I took the part because I wanted to work. I also needed some money...it wasn't challenging, but it paid the bills! It wasn't hard work either. I hardly had to try because it wasn't expected." Stephen wanting to work is no surprise, considering that if you look at the list of movies he's done it isn't unusual to see two or three a year. Later that year however, Stephen picked up rave reviews for his role in "BackBeat" portraying Stuart Sutcliffe, the original bassist for the Beatles. For the movie he had to learn a "liverpudlian" accent, and play a part that dealt with real people, people who still were alive to see him portraying a friend. To this day it is one of his favorite movies he's done. His next character was written especially for him. Director Jefery Levy saw a photo of him and thought that he was perfect for a character he was writing, so he taped the pic next to his computer. The movie turned out to be S.F.W. And Stephen's role was the lead character of Cliff Spab. In the movie, his character is attacked by fame, so to speak. "He does not edit any of his feelings..."said Levy of Dorff, "...He could learn to relax a little. He drinks maybe twenty cokes a day and five cups of coffee." Stephen then starred in two French movies, "Les Cent et Une Nuits", and "Innocent Lies" (Halcyon Days). Trying to find a way to stretch his abilities Stephen tried to get in on "To Wong Foo, Thanks For Everything Julie Newmar." He was turned down for a role, but made the best of it and starred as the drag queen Candy Darling in "I Shot Andy Warhol". It was a much riskier and the film ended up garnering much more respect by critics and shock and awe by fans. Dorff doesn't choose every movie based on sheer content. He makes it a point to take oppertunities to work with actors he respects. He worked with Dennis Hopper on "Space Truckers"...and Jack Nicholson on "Blood and Wine". He and Jack have maintained a friendship ever since. "People like Jack make all the stress and craziness of the business worthwhile. He's given me so much advice. I care alot about him." He then worked with another actor he much respected, Harvey Keitel. "City Of Industry" was slated for big time motion picture success but only made a little roar. The role however had Dorff taking full advantage of his abilities, playing seemingly casual get-away driver turned cold blooded killer, Skip Kovich. Stephen's next and most well known movie, was "Blade". It starred Wesley Snipes in the title role of the daywalking vampire, and cast Stephen opposite as the seductively evil Deacon Frost, a vampire ready to overtake the world of the humans. On Playing A Vampire: "It's always exciting to play someone who's dark, who you almost want to like, but who you want to be afraid of - it's a cool thing to do as an actor." The role won him accolades by fans, including his first "real" awards, the Blockbuster and MTV awards for Best Villian. Stephen was turned down for the role of that guy in the movie about the big ship. On Titanic: "I want to have a career like Johnny Depp, Sean Penn and Jack Nicholson. I want to win an Oscar one day. That would've been impossible if I'd got Titanic." He recouped with his role in the HBO TV movie "Earthly Possessions" with Susan Sarandon. He decided to move back into his independent films. He also made another celeb connection on his next movie, "Entropy" where he met and befriended U2's Bono. His last two films were also breakthroughs. For the first, he worked with "Pink Flamingos" director John Waters for the movie "Cecil B. Demented". Ironically he played the lead character, a character with a disdain for commercial films. The second film, "Quantum Project" was the first movie made exclusively for the internet. 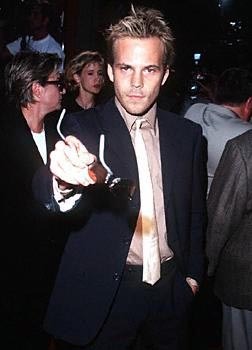 A lot of writers like to call Stephen Dorff the "angriest man in Hollywood", "arrogant" or most laughably "Hollywood's Rude Boy Wonder", when he should really be called the actor that is everywhere and seemingly no where...an actor who's managed to carve out a career that includes two to three movies a year, high critical acclaim and yet be his outspoken self. "It's just how I am. I'm to be me as honestly as possible. People sometimes keep things to themselves in order to be polite but that's a form of lying. If something comes into my head I'll say it. That means people think I'm the most arrogant actor around. I don't care as long as I'm saying what I truly feel and believe." Deuces Wild, a violent 50's period piece. Dorff plays Leon, the leader of a gang called the Deuces who attempts to keep drugs and violence off their block. Their opposition? The Vipers, headed up by Marco (Norman Reedus). It also stars Fariuza Balk and Frankie Muniz. FearDotCom, a dark horror flick that just arrived on DVD here in the states. Dorff stars as a homicide cop that dares to enter the site, FearDotCom.com, and play the deadly game within. Solve the puzzle or die within 48 hours. Dorff recently finished filming The Devil's Throat, costarring Sharon Stone, Dennis Quaid and Juliette Lewis in Onterio, Canada. Although the details of the plot are sketchy at best, look for Dorff as another villian fresh out of jail looking to take back his home, now inhabited by Stone and Quaid. Den of Lions: Filmed in Budapest, Hungary, this film also stars Bob Hoskins. Check out the web log, link located in our links section, for some great behind the scenes pictures. Riders: This film has already been released overseas and co-stars Natasha Henstridge and Bruce Payne. Dorff plays Slim, a bandit leading up a group extreme bank robbers. All For Nothin': The film is based on the true story of telecommunications genius Walter L. Shaw Sr. and his son Walter T. Shaw. It co-stars Ben Kingsley. This biography written by Silverpoet and property of the Dorff Project. It really doesn't take to long to write your own.. :) Does it?